The Husqvarna 900DRT offers the advantages of both a forward rotating cultivator and a counter rotating deep soil tiller. This rear tine tiller digs deep, while an adjustable bar allows for soil penetration control. The operator can choose forward rotation for cultivating or turning crops or counter rotation for deep tilling during planting season. Sealed chain gear transmission ensures long life coupled with a powerful, durable Honda engine. Our DRT series of high-performance rear-tine tillers have the capacity to till deep, even in hard soils. They feature drive wheels with heavy tread tires for optimized grip, plus forward and reverse gear for easy operation. 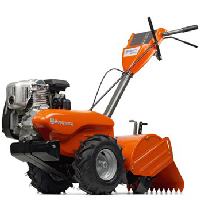 Equipped with powerful, reliable Honda or Briggs & Stratton engines, these machines target landowners who have large areas to till and demand first class results. The dual rotating tines provide deep soil tilling on densely packed earth as well as older lawns. All models feature forward-rotating tines that allow the option of performing top soil cultivation in smaller gardens. The DRT900LS provides an extra wide 19″ tilling width. Handles heavy packed earth with ease. 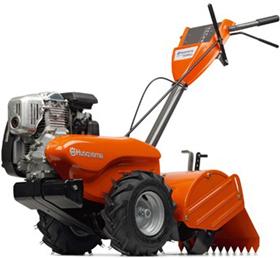 The DRT900LS is a solid choice for both the homeowner and landscaping professionals. Advanced Rear-tine tiller for heavy duty use. It’s a powerful, reliable machine that tills the soil with little effort on the part of the operator.